During its one-year mission, NASA's Wide-field Infrared Survey Explorer, or WISE, mapped the entire sky in infrared light. Among the multitudes of astronomical bodies that have been discovered by the NEOWISE portion of the WISE mission are 20 comets. 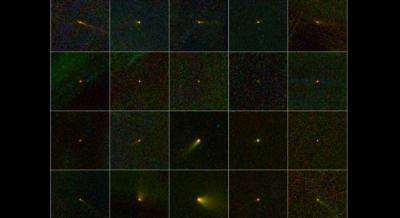 (PhysOrg.com) -- NASA's NEOWISE mission has completed its survey of small bodies, asteroids and comets, in our solar system. The mission's discoveries of previously unknown objects include 20 comets, more than 33,000 asteroids in the main belt between Mars and Jupiter, and 134 near-Earth objects (NEOs). The NEOs are asteroids and comets with orbits that come within 45 million kilometers (28 million miles) of Earth's path around the sun. NEOWISE is an enhancement of the Wide-field Infrared Survey Explorer, or WISE, mission that launched in December 2009. WISE scanned the entire celestial sky in infrared light about 1.5 times. It captured more than 2.7 million images of objects in space, ranging from faraway galaxies to asteroids and comets close to Earth. In early October 2010, after completing its prime science mission, the spacecraft ran out of the frozen coolant that keeps its instrumentation cold. However, two of its four infrared cameras remained operational. These two channels were still useful for asteroid hunting, so NASA extended the NEOWISE portion of the WISE mission by four months, with the primary purpose of hunting for more asteroids and comets, and to finish one complete scan of the main asteroid belt. "Even just one year of observations from the NEOWISE project has significantly increased our catalog of data on NEOs and the other small bodies of the solar systems," said Lindley Johnson, NASA's program executive for the NEO Observation Program. Now that NEOWISE has successfully completed a full sweep of the main asteroid belt, the WISE spacecraft will go into hibernation mode and remain in polar orbit around Earth, where it could be called back into service in the future. In addition to discovering new asteroids and comets, NEOWISE also confirmed the presence of objects in the main belt that had already been detected. In just one year, it observed about 153,000 rocky bodies out of approximately 500,000 known objects. Those include the 33,000 that NEOWISE discovered. NEOWISE also observed known objects closer and farther to us than the main belt, including roughly 2,000 asteroids that orbit along with Jupiter, hundreds of NEOs and more than 100 comets. These observations will be key to determining the objects' sizes and compositions. Visible-light data alone reveal how much sunlight reflects off an asteroid, whereas infrared data is much more directly related to the object's size. By combining visible and infrared measurements, astronomers also can learn about the compositions of the rocky bodies -- for example, whether they are solid or crumbly. The findings will lead to a much-improved picture of the various asteroid populations. NEOWISE took longer to survey the whole asteroid belt than WISE took to scan the entire sky because most of the asteroids are moving in the same direction around the sun as the spacecraft moves while it orbits Earth. The spacecraft field of view had to catch up to, and lap, the movement of the asteroids in order to see them all. "You can think of Earth and the asteroids as racehorses moving along in a track," said Amy Mainzer, the principal investigator of NEOWISE at NASA's Jet Propulsion Laboratory in Pasadena, Calif. "We're moving along together around the sun, but the main belt asteroids are like horses on the outer part of the track. They take longer to orbit than us, so we eventually lap them." NEOWISE data on the asteroid and comet orbits are catalogued at the NASA-funded International Astronomical Union's Minor Planet Center, a clearinghouse for information about all solar system bodies at the Smithsonian Astrophysical Observatory in Cambridge, Mass. The science team is analyzing the infrared observations now and will publish new findings in the coming months. When combined with WISE observations, NEOWISE data will aid in the discovery of the closest dim stars, called brown dwarfs. These observations have the potential to reveal a brown dwarf even closer to us than our closest known star, Proxima Centauri, if such an object does exist. Likewise, if there is a hidden gas-giant planet in the outer reaches of our solar system, data from WISE and NEOWISE could detect it. The first batch of observations from the WISE mission will be available to the public and astronomical community in April. "WISE has unearthed a mother lode of amazing sources, and we're having a great time figuring out their nature," said Edward (Ned) Wright, the principal investigator of WISE at UCLA. Elietist liberal lies. You can't get into space because the firmament gets in the way. Biblical fact.